Finding new salads is always challenging, especially given the frequency of receiving mixed greens in our CSA basket. Dave found this recipe online and the combination of flavors sounded amazing. This recipe is from Maricel E. Presilla and inspired by the flavors of Cuban cooking. We typically receive between 3.5 and 4 cups of greens in each of our CSA baskets so I adapted this recipe to have only two servings. I am one of the weird people who loves pineapple on pizza, it's my favorite pizza topping and I think that it absolutely has a place in savory cooking. Even though I was unsure about some of these ingredients together this recipe was great. 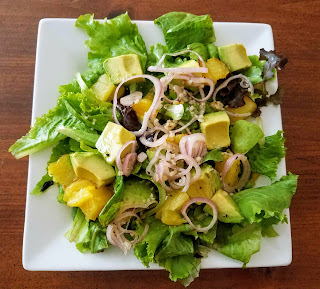 The pineapple was sweet and went well with the tangy dressing, all of the seasoning and the texture of the avocado helped to pull all of the flavors together into a composed dish. I probably won't make a new salad next week and will just make this again. Recipe slightly adapted from Maricel E. Presilla. To make the pineapple, place the pineapple slices on a foil lined baking sheet and sprinkle the sugar evenly over top. Broil about 4 inches from the heat source, turning once, for 5-10 minutes or until each side is golden brown. 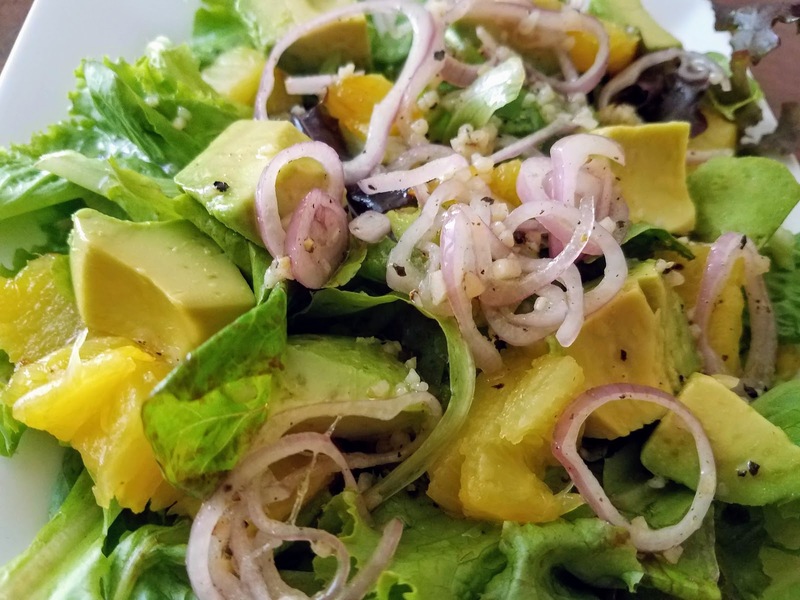 While the pineapple is broiling make the dressing by whisking together the garlic, olive oil, apple cider vinegar, cumin, salt, and pepper. Taste for seasoning and adjust as needed. Marinate the shallots in the dressing until ready to serve, then remove. Cut the pineapple into 1-inch pieces. To make the salad, toss the mixed greens in the dressing. 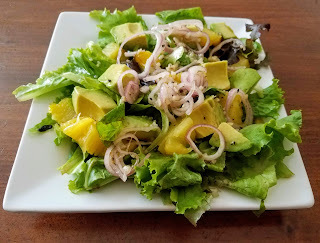 Top each salad with half of the pineapple and half of the avocado. Garnish with the slivered shallots and serve immediately.